Oxford University Press, USA, 9780199743162, 312pp. Here is an unprecedented collection of twenty freewheeling and revealing interviews with major players in the ongoing--and increasingly heated--debate about the relationship between religion and science. These lively conversations cover the most important and interesting topics imaginable: the Big Bang, the origins of life, the nature of consciousness, the foundations of religion, the meaning of God, and much more. 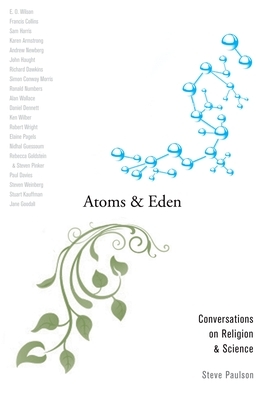 In Atoms and Eden, Peabody Award-winning journalist Steve Paulson explores these topics with some of the most prominent public intellectuals of our time, including Richard Dawkins, Karen Armstrong, E. O. Wilson, Sam Harris, Elaine Pagels, Francis Collins, Daniel Dennett, Jane Goodall, Paul Davies, and Steven Weinberg. The interviewees include Christians, Buddhists, Jews, and Muslims, as well as agnostics, atheists, and other scholars who hold perspectives that are hard to categorize. Paulson's interviews sweep across a broad range of scientific disciplines--evolutionary biology, quantum physics, cosmology, and neuroscience--and also explore key issues in theology, religious history, and what William James called ''the varieties of religious experience.'' Collectively, these engaging dialogues cover the major issues that have often pitted science against religion--from the origins of the universe to debates about God, Darwin, the nature of reality, and the limits of human reason. These are complex, intellectually rich discussions, presented in an accessible and engaging manner. Most of these interviews were originally published as individual cover stories for Salon.com, where they generated a huge reader response. Public Radio's "To the Best of Our Knowledge" will present a major companion series on related topics this fall. A feast of ideas and competing perspectives, this volume will appeal to scientists, spiritual seekers, and the intellectually curious. Steve Paulson is Executive Producer of Wisconsin Public Radio's nationally syndicated radio program "To the Best of Our Knowledge." He is a recipient of the Templeton-Cambridge Journalism Fellowship in Science and Religion. He has written for Salon, Slate, and other publications, and has produced feature stories for NPR's "Morning Edition" and "All Things Considered."